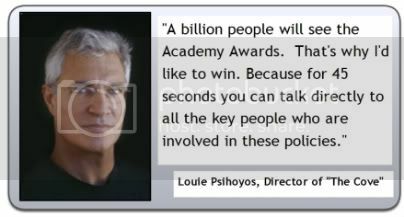 Louie Psihoyos wants to win an Academy Award. For the Director of the Oscar-nominated documentary “The Cove,” being nominated is great, but when the envelope is opened, he wants to hear his film called out. Mind you, Psihoyos doesn’t much care about the award itself (“I’d probably give it to the crew,” he said. ), but he wants what he sees as the biggest benefit an Oscar offers – a massive audience. What Psihoyos wants to talk about is the subject of his highly praised documentary – the wholesale slaughter of Dolphins in Taiji, Japan. But should “The Cove” not win the Oscar for Best Documentary, Psihoyos has already gotten the word out to millions about the formerly secret slaughter. And just this week, it was announced that the film will now be in front of people he knows can make the biggest difference – the people of Japan. On Feb. 8, The Works International announced that “The Cove” had been acquired by Japanese distributor Medallion Media which is planning a tentative release date of April 2010 in Japan. Carl Clifton, Managing Director of The Works International, applauded Medallion for taking the film directly to the people of Japan. “The Cove” – which currently has an almost-unheard of 8.5 rating at The Internet Movie Database – highlights the annual, six-month slaughter of dolphins in Taiji. The dolphins are rounded up by fisherman, who use sonar and bang on long poles to frighten and herd the dolphins into a cove. After highly sought-after “show dolphins” – dolphins which will be taken captive and trained at Ocean parks like Sea World – are selected, the dolphins are then herded into a once-secret cove, where they are slaughtered. Each year, more than 20,000 dolphins are killed. 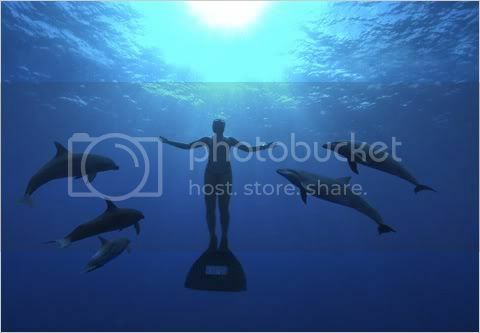 The actual cove where the dolphins are being slaughtered was a long-held secret by the Taiji and Japanese governments. But Psihoyos (“I probably watched too many James Bond movies as a kid,” he laughs”) put together his own “Ocean’s 11″ squad of filmmakers, divers and activists to penetrate the cove under the cover of darkness, hiding cameras and sound equipment throughout the area. The end result was video that is at once educating and blood-curdling. But despite the video and the film, the killing continues. “At the beginning of the year they stopped killing bottle-nose dolphins, but they have started the killing again,” said Psihoyos, who started the non-profit Oceanic Preservation Society in 2005. The film follows former dolphin trainer Ric O’Barry, who trained the dolphins in the hit 1960s TV show “Flipper.” O’Barry has long felt a responsibility for the popularity of performing dolphins that took off following the TV Show, and sees his own fingerprints on the slaughter. 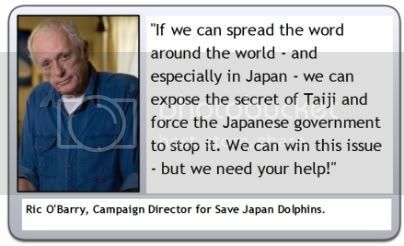 Now the most prominent and tireless defender of dolphins, “The Cove” highlights his fight to free and save the intelligent mammals. Aside from being a documentation of atrocities against dolphins, O’Barry’s fight for redemption, and the cloak-and-dagger operation, “The Cove” also showcases a problem for mankind – the massive elevation of mercury in the systems of sea mammals like dolphins and whales. The problem is showcased in Taiji, where the dolphins have been used as a food source, and where authorities attempted to get dolphin meat into schools across the nation. Psihoyos said that thus far, even with the film, the Japanese government has been of no help to either the dolphins, or their own people. Which is why getting the movie in front of Japanese audiences is such a coup for the filmmaker. In a time when their government is experiencing the same economic crisis as the rest of the planet, the Japanese government is actually using tax payer money to keep the needless killing of dolphins going. Having already scaled the heights with his first film, Psihoyos is now working on what he calls a companion piece for “The Cove,” which will look at the degradation of the world’s ocean by humankind. But despite the harrowing subject matter, Psihoyos takes to his burgeoning film making and activism career with optimism. He can see things turning around with a new generation of Americans. So come Oscar night, Psihoyos will be in the audience, hoping to receive the Oscar for Best Documentary. But that won’t be the true prize he’s after. “We’ve won a lot of awards. But I didn’t get in the business of making films to win awards. The real awards are to solve these problems,” said Psihoyos. After learning the massive carbon footprint that making a film creates, Psihoyos made the second half of the film using only solar energy, including solar-powered vehicles. Psihoyos' film is brilliant – one of the best documentaries ever made, IMHO – and O'Barry is truly a tragic/heroic figure. I cannot imagine what the reaction will be if "The Cove" plays in Japan. This was a nation, after all, that at the end of WWII was planning to send out its own children, armed with bamboo spears, to face the expected American invasion force. The reasons why they surrendered to us, I am now convinced, had a lot less to do with the A-bomb than not wanting to be mass-raped by the Soviet Red Army (which had just declared war on them) the way the Germans were (of course, it would have been kharmic payback for Nanking). I've never lived in Japan or studied the culture extensively, but it's obvious there's a stultifying, even frightening social conformity at work there. Outside pressure may up the stress level, but watching Whale Wars convinces me that the only meaningful change will come from within. How? No idea. But keep up the good – no GREAT – work! But just two days before his Joan laporta has coach outlet for the ruling and vice chairman of the competent financial period, Columbia University professor of economics Marty defended. Joan laporta has no says, since 2003 as cheap coach bags President since the work team performance is impeccable ", "most of the club in the overhead construction and development of the team in Barcelona, because of this is a coach handbags football team, with YiNieSiDa, Harvey, Gerard coach backpacks, carles puyol, villa, etc, but also owns the Spain international world star messi. "Whether in athletic or economy, we have created a history of Barcelona." Joan laporta has no say.This article was written by joy1709 on 2010-10-21 from us-trade company.